Base your decisions on God’s Word and not your feelings. When I speak I try to keep it interesting. I try to keep it real. I try to keep it understandable. But I am not there to entertain an audience or to make people feel good. My job, if you will, is to exposit the Word of God. 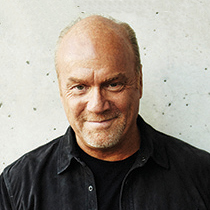 Because it really doesn’t matter what Greg Laurie thinks about anything. My opinion isn’t any better than anyone else’s opinion. For me as a pastor, I have a responsibility to declare the whole counsel of God and feed the flock of God. That is the advantage of expository preaching and teaching. By expository, I mean taking the text and letting it unfold. We don’t impose our views on the text; we let the text impose its views on us. It is not for us to add things to the text. Sometimes pastors use a text as a point of departure for their messages. A verse will be read, and then whoever is speaking will just tell stories. They might be good stories. They might be good jokes. They might be very entertaining. And as you leave, you might say, “That was so good. I loved that. It was really good.” You have no idea what he said, but you know it was fun. The apostle Paul told the Ephesian elders, “For I have not shunned to declare to you the whole counsel of God” (Acts 20:27). I think that is the most important thing. We need to get our minds oriented toward what the Bible says. Too often we build our opinions on our feelings. But it doesn’t matter what we feel. What does the Bible say? Do what the Bible says, because feelings can mislead you. Don’t base decisions in life on mere feelings. Base them on the Word of God.